Sharing is caring! Click below to share with friends & family on all your social accounts! 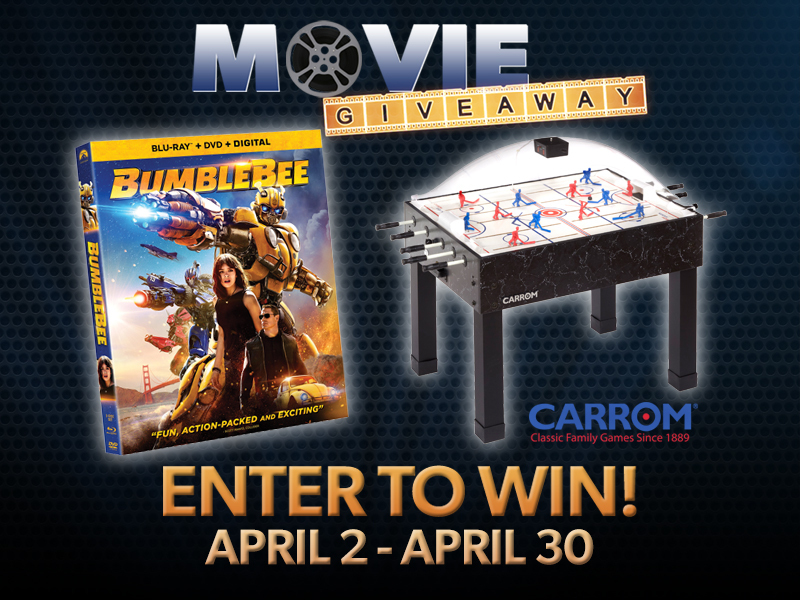 Enter below to win a Carrom Super Stick Air Hockey Table, a 4K Blu-ray player and Bumblebee on Blu-ray! *Must be 18+ to win and a resident of Virginia or North Carolina. Winners chosen at random. Good luck! Must be 21+ to win. This promotion is in no way sponsored, endorsed or administered by, or associated with, Facebook. You are providing your information to WSKY and not to Facebook. Contest winner must be 18 years or older. Contest winner must be a legal resident of Virginia or North Carolina. Contest entry dates are April 2, 2019, through April 30, 2019. Contestants will enter the contest through SKY4's Facebook page at https://www.facebook.com/SKY4tv. Winner selection will occur on May 1, 2019. One (1) Grand Prize winner will win a Carrom Super Stick Air Hockey Table, a 4K Blu-ray player and a copy of Bumblebee on Blu-Ray. Five (5) runner-up winners will each receive a copy of Bumblebee on Blu-Ray. Lockwood Broadcast Group and WSKY – SKY4 are not responsible for the inability of a contestant to log in or for any other technical problems on either end. Contest winner(s) will be notified via email or the phone number that was provided during submission. Winners have three (3) business days from the initial contact to respond. Failure to respond will result in disqualification and SKY4 reserves the right to choose a replacement winner. Odds of winning dependent upon the number of entries received. Only one entry per person is considered. The winner is determined only by WSKY – SKY4. WSKY – SKY4 decisions are final. All winners are chosen at random unless otherwise noted. The winner may not substitute the prize. Employees and their immediate families of Lockwood Broadcast Group, WSKY – SKY4 TV clients, or other participating promotional partners and their respective parents, affiliates, subsidiaries, or agencies are ineligible to participate in this contest. This contest is subject to all federal, state, and local laws. All federal, state, and other tax liabilities arising from this contest, as well as all incidentals and gratuities incurred in using the prize, will be the responsibility of contest prize winners and not Lockwood Broadcast Group and WSKY – SKY4. Winner’s entry and acceptance of prizes constitute permission to use his/her name, photograph, and likeness for purpose of advertising and promotion on behalf of Lockwood Broadcast Group and WSKY – SKY4 without compensation. Winners agree that Lockwood Broadcast Group, WSKY – SKY4, and their employees, parents, affiliates, subsidiaries, or agencies shall not be liable for losses or injuries of any kind resulting from acceptance of and/or participation in the prize. Winners will be asked to come to WSKY – SKY4 TV office in Hampton, VA during normal business hours (Monday through Friday between 9am and 1pm or 3pm and 5pm) by March 7, 2019. Winners will be required to provide positive photo identification, their Social Security number, and a residential address to receive the prize. The prizes will be awarded after the receipt of the winner’s information. Failure to complete prize claim information by March 7, 2019, after being notified may result in disqualification. WSKY – SKY4 reserves the right to keep any prizes that are not obtained by the chosen winner(s). Prizes will not be mailed. If the winner(s) are unable to pick up their prize from the WSKY – SKY4 TV station office, they may send written consent naming a representative that may pick up on their behalf. The winner will also be asked to email a photo of their Photo ID or Driver's License to WSKY – SKY4 TV, in order to confirm that they are eligible (at least 18 years of age, a resident of Virginia or North Carolina) to win the prizes listed above. Any individual(s) picking up on the behalf of a winner must be 18 years of age or older. WSKY – SKY4 TV is not responsible for prizes after they are picked up by this representative. Prizes will not be given to any individual who is not mentioned in written consent from the initial winner. Individuals picking up on the behalf of a winner will be required to fill out a prize winner agreement in their own name. Prizes valued at $600 or more will require the completion of a W9 tax form. Prizes valued at $600 or more may not be picked up by any individual(s) besides the initial winner. Winners receiving multiple prizes within one year that total $600 or more will be required to complete a W9 tax form. Winners will be required to execute forms releasing Lockwood Broadcast Group, WSKY – SKY4, and their employees, parents, affiliates, subsidiaries, or agencies from any and all liability prior to receiving any prize.